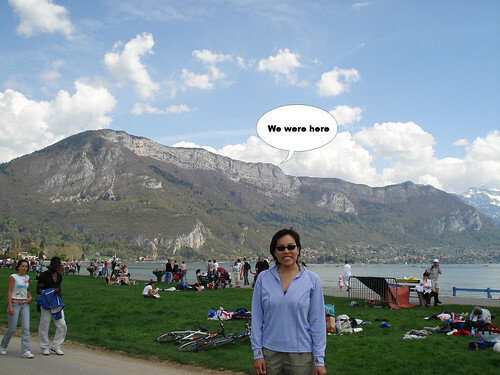 We drove to beautiful lake Annecy to ride the bike path and found that it was closed due to the annual marathon. And the park beside the lake was a zoo, so we got on our bikes and went exploring the other way. And we discovered a great national park forest route up to a col that I had never heard of (Col des Contrabandiers — translated: Smugglers Pass). The blurb in the first photo points to where we biked and took the other photos below. The road ends at the col. 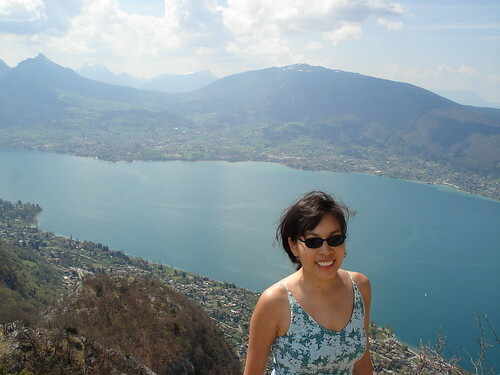 But a 20 minute hike took us 200 metres higher and a view of the lake. I’ve been following your blog for a while now although this is the first time I’ve commented – I have to say I’m impressed by your challenge and some (read: most) of the rides you do! 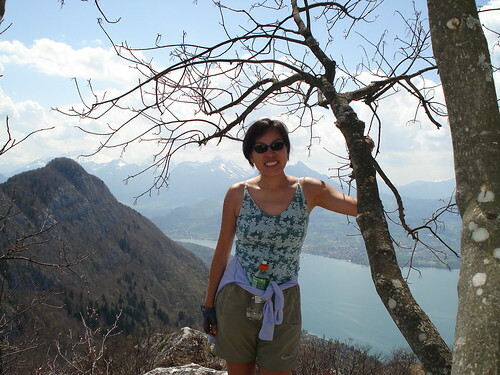 I just spent 6 months living in Annecy and have spent quite a lot of time living on and off on the edge of Geneva – so since finding your site I’ve been looking at your posts more and more for inspiration for my own cycling adventures! I’m more of a ‘casual’ cyclist (I only have 1 bike 😛 – and it’s a mountain bike), but some of your easier climbs are within my range. Anyway, I see you have a trackback link (the one right above this comment) to my post on this climb you did in ’06, but I did it at the end of July this year. All the way up I was wondering why you recommended not using a road bike (every 100m my mountain bike seemed to weigh 1kg more) – I understood your recommendation on the way down though! Sadly someone decided to break the two posts holding up the col sign, but at least it’s still up there, leaning against a tree… Just wanted to say thanks for pointing out such a great route (and view) and good luck with the rest of the challenge! 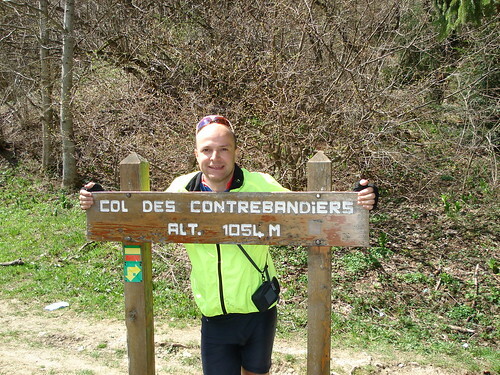 Yes I rode Contrebandiers again in Feb 2008 as well and saw the sign had been broken – the road seemed in pretty lousy condition then (the snow didn’t help). But it’s a great ride. PS – I think the trackback is automatic as you linked here from your blog. I’m guessing the road had degraded more since you originally did it – now to go down on a road bike you’d have to take it pretty slowly. Thanks for your comment on my blog – agreed, there are some great places to go in Provence, and as for Ventoux, I’m actually closer then my blog might make you think 😉 I’m staying a few km from Malaucene, so a great place to start from for Ventoux – except I don’t have my bike with me! 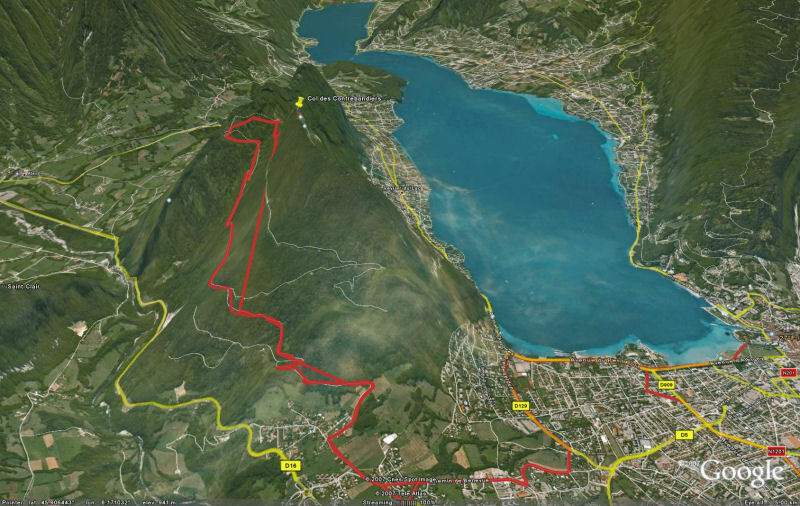 I should be exploring parts of the Jura though in a couple of weeks, so expect some more trackbacks around then to some of your rides.